After the marriage of Prince Harry to Ms Megan Markle, I wish to convey further good news to you, and to the rest of your Royal family. As your military attaché in Africa, it gives me great pleasure to advise that the Boers have been conquered at the battle of Harrismith which took place on the 2nd & 3rd June 2018. The white flag of surrender was raised by General Hamman, at 13h00 on this historical day for your universal British Empire. During my lengthy military career I have never witnessed a display of such loyalty and courage, as shown by your troops in this bloody battle. Your forces received only a few minor scratches and bruises, while the Boer field hospital has called for additional nursing staff, surgeons and even psychiatrists to treat their mentally scarred soldiers. There were no fatalities. Your Majesty will also be most pleased to hear that during the cease-fire period, as declared by Chief Justice Lord George Galloway, the British and Boer troops were treated to an elaborate Royal Banquet. At this very grand occasion, the soldiers from both sides mingled and socialized well. In some cases, too well! This developing inter-continental relationship seems to be getting stronger, despite the humiliating defeat dealt out to the Boers. On a personal note, please pass on my fondest greetings to my old friend Prince Phillip. I trust he is enjoying his retirement. I await your instructions regarding any further military operations required . After years of dedicated and compassionate service to the Harrismith community, the staff of this vitally important organization, have been rewarded. Their next door neighbors, the Harrismith Golf Club, arranged a benefit golf event. What a success it was! When Golf Captain John Venning asked Mandy Pollock what their most desperate need was, she answered "a bakkie". She went onto explain, that the staff were using their personal vehicles to pick up abused, sick, injured and bleeding dogs and cats. Not an ideal situation. No challenge is too big for John Venning, who mobilized the golf committee, members, businesses and most of the Harrismith community. Requests for financial assistance were answered with enormous generosity. A suitable second hand bakkie (canopy included) was purchased from Mortimer Toyota by Mark Bebington, with the condition, "pay me back when you are able". He will not have to wait long. The R70000.00 price tag, has already been collected from Harrismith's incredible donors. Emotions ran high when, at the prize giving, the branded bakkie was driven into the arena. And when John handed over the keys to Mandy, there were lumps in the throat, tears of joy, and goose bumps amongst the large crowd. All concerned with the support of this project can take a bow- what an amazing community we live in! A special message from the Golf Captain, John Venning. "On behalf of the Club, I wish to express our sincere and heartfelt thanks, to all who were approached and contributed to this benefit event". Thanks to you, John. Your commitment to this project was immense! Members, Animal Shelter personnel and friends, celebrated this special event, long into the night. 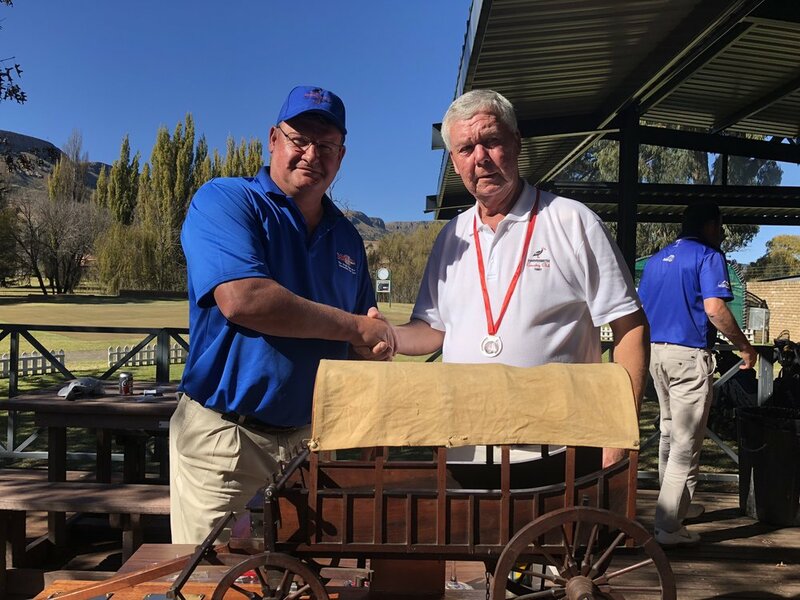 Although the Harrismith Animal Shelter were the real winners, the four-ball alliance results were as follows. 1st (90 points) : Fritz Valks, Elzane Valks, Gerhard van Eeden, and Monty Galloway. 2nd (89 points) : Kobus Bester, Johan de Klerk, Tienie Els, and Dries Lategan. 3rd (88 points) : Ferdie Van Vuuren, Hernu Van Vuuren, Wally Botha, & Jan Harm Van der Merwe. It was a day of records! For the first time in this reporters Harrismith golf career, three players scored 66 nett in a "Mug" competition. 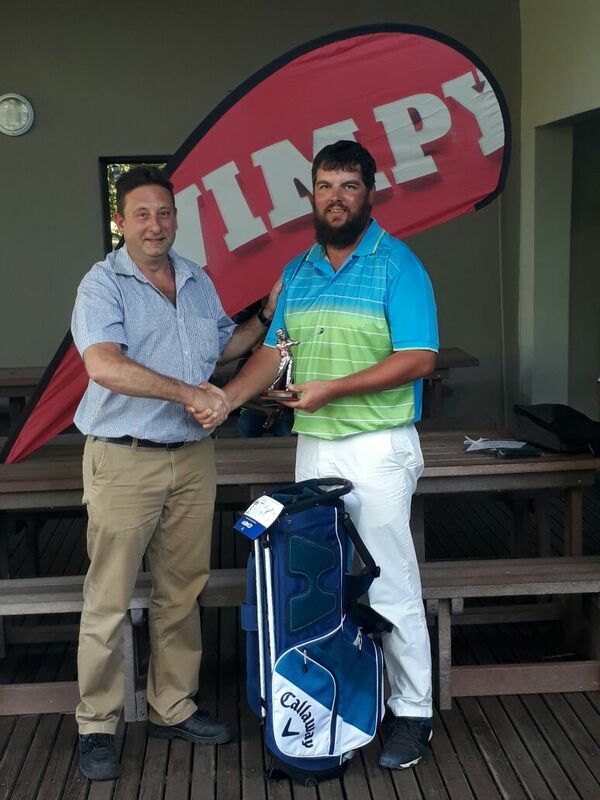 Included in this trio was Pieter Cronje, who equalled the course record of 65 gross! This was achieved without dropping a single shot to par, while recording seven birdies. An absolutely remarkable round of golf! It will be a round that Pieter will remember for the rest of his life. Quinton Konig, also played the best round of his golf career to score a 77 gross. His 66 was easily good enough to win the B Division. Perhaps this will prove to be the last competition that Quinton will be contesting in this Division. He is comfortably good enough to be playing in the A Division. Ebbie van Rooyen called a penalty on himself, for not replacing the ball after it had accidentally moved. The game generally repays its players for acts of sportsmanship and honesty. This was certainly the case on Saturday, when Ebbie won the count-out to win this unbelievable edition of the Monthly Mug. Well done Ebbie ….. Justice! Dries Lategan recently visited a coaching professional, in order to rectify some bad habits that had crept into his game. This coaching session has immediately made a huge difference to Dries’ ball striking. Dries scored a 67 nett to triumph in the C Division. The owner of Subway Service Station, Emile de Beer is again thanked for this legendary sponsorship. For those on the roads over Easter… travel safe, enjoy this special time and get back home in one piece to join us for more golf!